This is the start of a new occasional series on some of the more peculiar arguments I've come across in early Christian literature. These are the quirky bits that somehow never made it into the textbooks. John Chrysostom, the great fourth-century preacher, described Christ's descent into hell as a kind of poison eucharist. When Christ died, his body descended into the ground. Death ingested his body like food. But this was no ordinary food. It was a fatal poison. It brought on violent stomach cramps, worse (Chrysostom assures us) than the agony of a woman in labour. Death could not digest Christ's body. Death writhed in pain, then vomited: "Like those who take food and vomit it up because they can't retain it, so death vomited. He received the body which he could not digest, and so he had to throw it up again" (all this is from homily 24 on 1 Cor). But after developing this vomiting image in graphic detail, Chrysostom changes his mind. No, he observes, Christ didn't come back out of the mouth of death. He didn't come out the same way he went in. Death didn't merely vomit; it suffered a massive abdominal rupture. After death had ingested Christ's body – I warn you, this is pretty grisly – it suffered violent convulsions, and then its stomach burst open. Everything came out. 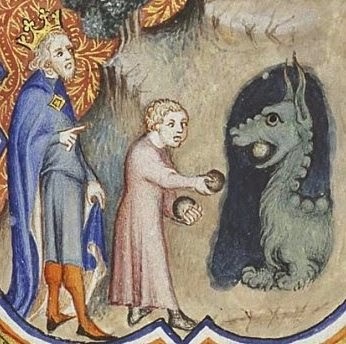 Chrysostom is thinking here of the story in Bel and the Dragon, where Daniel killed the dragon by feeding it a concoction of pitch and fat and hair; upon eating this vicious recipe, the dragon's stomach burst open and it died. "For Christ didn't come forth again from the mouth of death, but issued forth from the belly of the dragon, bursting it and ripping it open from within." Thus the body of Christ proves to be a fatal poison. It destroys death from within. When the stomach of death is violently emptied, it's not only Christ's body that is released. Everything else that death had ever ingested is released as well. The contents of death's stomach are completely emptied. Hell is left empty, and not a single one who died is left in the grave. And Chrysostom's point? "This is the body that he has given to us to hold and to eat!" These grisly reflections come, after all, in a sermon on the eucharist. Chrysostom is reminding his congregation never to come carelessly or irreverently to the table. "Purify your soul, prepare your mind for the reception of these mysteries!" The same body that poisoned death and emptied the grave is now ingested by the believer. It is the same body, the same potent food. "So," Chrysostom cautions, "let us stir ourselves and be filled with horror." When you come to the table, don't forget what you're about to eat! "Because of this body I am no longer earth and ashes, no longer a prisoner, but free…. This body, nailed and scourged, was more than death could stand against. The sun turned aside its beams when it saw this body sacrificed. The veil was rent for this body, and the rocks burst open and the whole earth was shaken. This is the very same body!" At the Lord's table we hold this body in our hands. We "kiss" it and "bite it with our teeth." (Chrysostom observes that lovers often nibble each other when they're passionately kissing: in the same way we lovingly nibble the consecrated bread.) Death ingested this body, not knowing that it was eating its own death. The same body is life to us when we eat it. By poisoning and slaying all death's power, this food has become "our hope, our salvation, our light, our life."